Ehpro Morph ATL, DEL and SUB Adaptors, with the 3 adaptors, MORPH RTA can work with Atlantis, Delta II and Subtank coils. You will enjoy more changes and funs. 1. Choose the Adaptor you want to install. 2. Disassemble the top cap and bottom base that holds the glass in place base part. 3. Screw in the Chimney adaptor you want to use into the top cap. 4. Screw on the bottom coil adaptor that corresponds to the chimney and coil you are using to the bottom base. Make sure it is screwed on tight. 5. Unscrew the adjustable copper 510 pin connection with a flat head screwdriver, and unscrew the pin that makes contact with bottom portion of the coil. 6. Screw in the coil to the bottom coil adaptor. 7. Screw in the pin that corresponds with the bottom coil adaptor. Then screw the adjustable copper 510 pin connection back in. • ATL adaptors can only work with Atlantis tanks; DEL with Delta II ; SUB with Subtank. • One option just has one adaptor only. gives the Morph tank access to one of the all time greats in atomiser coils. 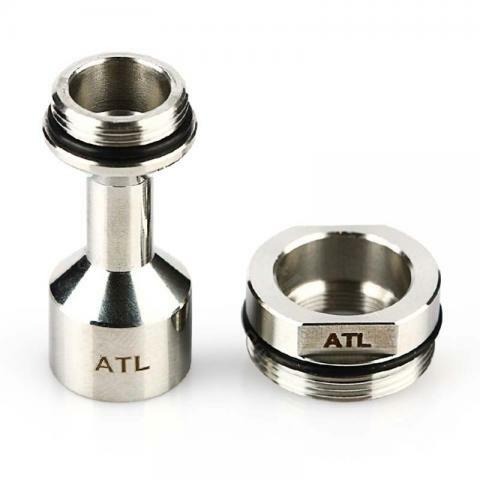 Ehpro Morph ATL/DEL/SUB Adapters are adapter that work with Atlantis, Delta II and subtank tanks. Made of stainless steel and 4.5ml volume.